• Provides Time And Date Stamping! • Will log 2000 Numbers! 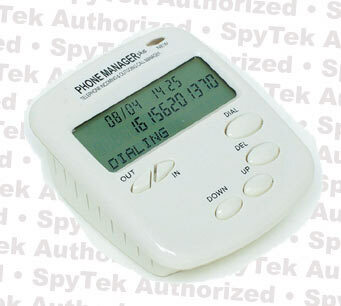 The Phone Manager Plus can be used with any telephone tape recorder or by itself to record and log dialed numbers as well as incoming phone numbers and other caller ID information with time and date stamping. It gives you the ability to not only record telephone calls but keep track of the dialed number of an outgoing party as well as log caller ID information for incoming calls. Easy to use, it will record and log 2000 logs.